A $25 million gift from a Los Angeles foundation will create the UCLA Laurie and Steven Gordon Commitment to Cure Parkinson’s Disease at the David Geffen School of Medicine at UCLA. The initiative will accelerate research into the disorder, which affects more than 10 million people around the world. The gift, from the Steven Gordon Family Foundation, will fund research, establish five endowed faculty chairs in fields related to Parkinson’s, and support a new lab with positron emission tomography, or PET scan, and MRI technology, where scientists can closely examine the mechanisms of the disease. Steven Gordon, the foundation’s president, is a member of the executive committee for the Centennial Campaign for UCLA, and on boards for the Ronald Reagan UCLA Medical Center, the UCLA Health System and the UCLA Ziman Center for Real Estate. He and his wife, Laurie, chair of the board of advisors of the Stewart and Lynda Resnick Neuropsychiatric Hospital at UCLA, have been steadfast advocates for funding neuroscience training and research, including in depression and Parkinson’s disease, at UCLA. 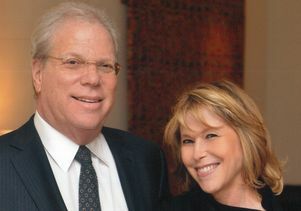 The gift complements previous giving by the Gordons to support Parkinson’s research at UCLA, including their endowment of the Steven C. Gordon Family Chair in Parkinson’s Disease Research, which is held by Dr. Carlos Portera-Cailliau, and support for a research collaboration with Cedars-Sinai Medical Center and the Weizmann Institute of Science in Israel. In recognition of the gift, UCLA’s Neuroscience Research Building will be renamed the Laurie and Steven Gordon Neurosciences Research Building, and the new imaging laboratory will be named for the couple. The Gordons hope other philanthropists will join them in their quest to improve the understanding of Parkinson’s and develop new treatments. “One of the most fulfilling aspects of our philanthropy is its ability to inspire hope in families who have been affected by diseases of the brain,” Laurie Gordon said. Steven Gordon is chairman and a principal owner of Domino Realty, a real estate holding company and venture firm. Laurie Gordon is a former attorney for United Artists Communications and former vice president of Warner Bros. International Theatres.